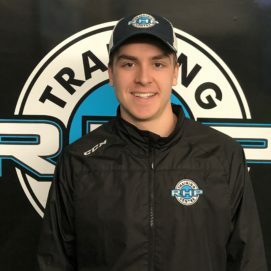 Mackenzie, serving as the Lead Goaltending Development Instructor, has spent many years being a goaltender and training at RHP Training Centre. He has worked with Shawn Sirman and Matt Bourgeois, at RHP Training Centre, since 2010. Mackenzie was chosen to be on the NOHA Minor Midget All Star team during the 2012-2013 season. During his 2013-14 season Mackenzie played for the Sudbury Nickel Capital Wolves Major Midget team where he was the top goalie in the GNML. The Nickel Capital Wolves won the GNML and advanced to the OHF’s where Mackenzie started 3 games and was awarded the game MVP for each of the games. In 2014 Mackenzie was invited to the Niagara Falls Ice Dog main camp, as a walk on, where he committed to an OHL contract with the team. Mackenzie has also competed as a member of his hometown OHL Sudbury Wolves. He is currently continuing his playing career with the Laurentian University Voyageurs Men’s Hockey Team. Mackenzie has been coaching for 6 years and loves passing on his knowledge and enthusiasm for the position to his students. RHP Training Centre is pleased to announce that Matt Bourgeois will be joining our Goaltending Development Team for the upcoming season! Coach Bourgeois has been coaching and developing goalies in North America, Europe and Asia for over 15 years. He has developed goalies from Initiation to the KHL. He spent the last two seasons in China working with their National Team goalies both Male and Female. Recently He also spent 4 months in Beijing as the Development lead for the NHL’s grassroots program. Now home, he will be acting as the Goalie Development Lead for Hockey Canada in Ontario, for their new Level 1 and level 2 Certification Program. He is of the belief that every hockey player is an individual and should be coached to their strengths. 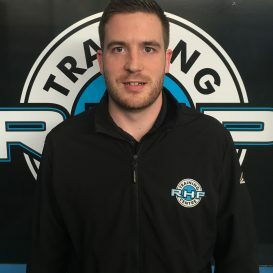 Coach Bourgeois currently works as a Goalie Specialist/Family Advisor and Player Representative in North America and has placed multiple players on Prep, Junior and Professional teams. 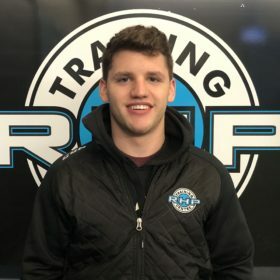 His involvement at RHP Training Centre this season will include Private On Ice Sessions for Goaltending Development, the NCHA and SDGHA Goaltending Programs as well as RHP Training Centre’s own Bi-Weekly Development Program. Shawn has been coaching at RHP since 2010! He has coached many successful goalies. He instructs Mackenzie Savard who signed an OHL contract with the Niagara Ice Dogs in 2014, as a free agent. He has coached goalies who have been chosen to represent NOHA on the Minor Midget NOHA All Star team. The past 2014-15 season Shawn was an assistant coach with the Sudbury Minor Midget Elite AA team. Shawn finished his college hockey career at New England college graduating with a degree in Business Management. In 2012-2013, Shawn was named to the ECAC East Second Team All-Conference. Prior to New England College, Shawn attended the University of Maine for two seasons with notable wins over perennial powerhouses; Boston College, North Dakota and Boston University. Before his college hockey career Shawn played junior hockey for the Blind River Beavers, Quinte West Pack and the Kingston Voyageurs. While in Kingston Shawn was named to Team Canada East and went on to win the bronze medal. Later that year he was also named to the Canadian Junior Hockey League Top Prospects Game in Summerside, PEI. In his final year of Junior hockey Shawn went on to the Royal Bank Cup Jr. A National Championships. Prior to this he was named the Dudley Hewitt Cup MVP and given the Top Goaltender of the tournament award. Shawn attended the Reading Royals camp of the ECHL, the Royals are an affiliate of the Washington Capitals of the NHL. In the final two years of University he was named to the Dean’s List which is awarded to students with a GPA of 3.5 and above. Shawn also received the George M. Paramenter Jr. Memorial Award for having the highest GPA amonst student athletes at New England College. Victor-Olivier Courchesne comes to RHP Training Centre with an accomplished playing and coaching career. He played in the Ligue de hockey prep school (LHPS) for the Collège St-Bernard located in Drummondville for three years. During those years he was twice recognized as an all-star and was awarded the Mathieu Darche trophy given to the best student-athlete in the league. From there, Victor would continue to experience the game at a high level, spending time in the USPHL, OHL and the NOJHL. He has also been a past member of the Laurentian University Men’s Hockey Team. Victor has been coaching goalies for the past 6 years with Hockey Passion, a goalie school in Quebec that counts some of its clients, NHL goaltenders Marc-Andre Fleury, Ondrej Pavelec, Louis Domingue. My name is Karen Collins and I am currently in my third year of the Sports Administration program at Laurentian University. Throughout my time at Laurentian I have been a goaltender for the Laurentian Varsity Women’s Hockey team. Before arriving to Laurentian University I played on the Peterborough Ice Kats Midget AA team for two years in the Ontario Women’s Hockey Association (OWHA), and 4 years of high school hockey on the Lakefield College School Varsity Women’s Hockey team in the Conference of Independent Schools of Ontario Athletic Association (CISAA). Previously I spent most of my minor hockey with the Bancroft Girl Jets Hockey Association in my hometown of Bancroft, Ontario. I have several years experience working at Canadian Hockey Enterprises based out of Peterborough, Ontario. Through this experience, I have enjoyed working with players on power skating, player development, and goalie instruction. My name is Shanna dolighan and I’m currently in my first year of Sports and Physical Education Con Ed at Laurentian University. This will be my first year playing as a goaltender on the Laurentian Women’s Hockey team. Previously I played in the PWHL for Leaside junior Wildcats and played for multiple different teams in the OWHA. My hometown is Oshawa Ontario in which I’ve had the chance to work with justgoalie helping goalies develop from an early age. Through this experience Ive enjoyed working with young athletes and watching them develop.